Notes: Found off the B275 (Shore Road) in the vicinity of Shearington. The castle is a popular tourist attraction and is sign-posted. A dedicated car park serves the castle. An impressive triangular castle dating from the late thirteenth century. The limited remains of an earlier stone tower are also visible and a number of reconstructed medieval siege weaponry is also on display. Castle is managed by Historic Scotland. 1. The Maxwell Clan also owned Threave Castle. Sir John Maxwell’s Castle. Upon being granted the lands in 1220, Sir John Maxwell built a square tower about 100 metres to the south of the later castle. Gatehouse. The impressive Gatehouse at Caerlaverock Castle. The primary seat of the Maxwell clan, Caerlaverock Castle was embroiled in the Wars of Independence almost as soon as it was built when it was besieged by King Edward I. 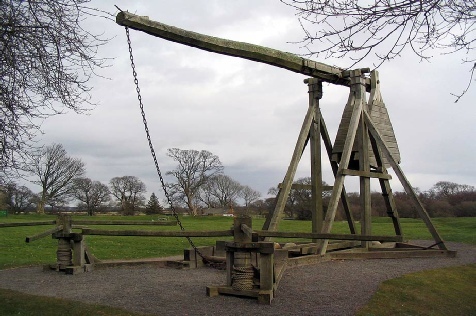 Later it saw action during the turbulent reign of Mary Queen of Scots and again in the Bishop’s War when it was attacked by Covenanter Army in 1640. In 1220 Alexander II granted the lands of Caerlaverock to Sir John Maxwell concurrent with his appointment as Warden of the West March. He built the first castle on the site - a square stone structure surrounded by a timber palisade. John’s successor, his brother Sir Aymer Maxwell, abandoned this castle in favour of a new site a few hundred metres to the north of the original. Built atop a rocky outcrop it was constructed to an unusual triangular shape with a circular tower at each corner. Completion occurred circa-1270. The castle's proximity to the English border and strategic location, near a fording point over the Solway, inevitably saw it involved in the Wars of Independence. When Alexander III died without a male heir in 1286 there were thirteen rivals for the Scottish throne - the leading candidates being Robert the Bruce and John Balliol. Edward I was invited to arbitrate in the succession debate and used the opportunity to establish dominion over Scotland. Both Robert and John swore allegiance to Edward as Lord Paramount of Scotland but when the claim was finally settled on Balliol, who was crowned as King John, both parties sought to backtrack. In September 1294 Edward ordered John to provide Scottish troops for his continental war with France but the request was defied and the 'Auld Alliance' - an agreement of mutual support - was forged between Scotland and France. The result was the first War of Scottish Independence which included several invasions by English forces. 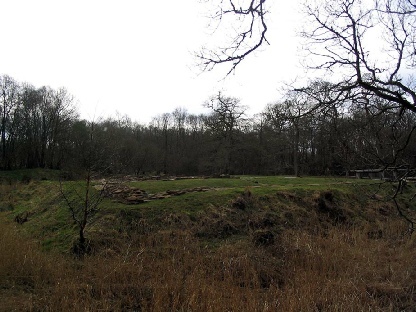 In 1299, as part of the ongoing conflict, the Maxwells led a force from Caerlaverock Castle to attack the English fortress at nearby Lochmaben. The following year though the castle came under attack itself from the entire might of King Edward I's army; in July 1298 the castle found itself in the direct line of invasion as Edward’s army forded the Solway on their way to rout William Wallace at the Battle of Falkirk. The sixty man garrison of Caerlaverock, under the Command of Sir Eustace Maxwell, mounted a spirited resistance but ultimately the castle was taken. Caerlaverock was restored to the Maxwell's but following the English rout at the Battle of Bannockburn (1314) they switched their support to Sir Robert Bruce. Another English siege attempting to re-capture the castle at this time failed. However, the prevailing view at the time was that castle strongholds favoured the English more than the Scots so Eustace partially dismantled the castle to prevent it falling back into English hands. A peace treaty of 1328 brought short term security to the border though and Caerlaverock was repaired and re-occupied but the attempted coup of Edward Balliol, son of King John, resulted in yet another attack on the castle; in 1355 Sir Roger Kirkpatrick captured and partially dismantled the castle. Thereafter the castle was once again restored to the Maxwells and underwent a flurry of building work between 1373 and 1450. The castle saw action again as a result of the Scottish Reformation. As the Protestant movement gained traction in Scotland, culminating in 1560, the Maxwells remained staunchly Catholic. Accordingly they supported Mary Queen of Scots even after her abdication in 1567 resulting in Caerlaverock being besieged by an English force under the Earl of Sussex in 1570. The castle was captured and, once again partially demolished. In 1593 Lord John Maxwell repaired the castle once again this time in anticipation of conflict with another Scottish Clan, the Johnstones of Annandale. No attack on the castle happened during this feud but John was killed in a skirmish with the Johnstones. His son, John Maxwell, continued the feud culminating in the murder of Sir James Johnstone in 1608 at a meeting under a flag of truce supposedly to reconcile their differences. He fled to France and in his absence was convicted of the murder; Caerlaverock Castle, along with other Maxwell titles, was forfeit. In 1612 John returned to Scotland to attempt a reconciliation but was arrested and executed by beheading in Edinburgh. 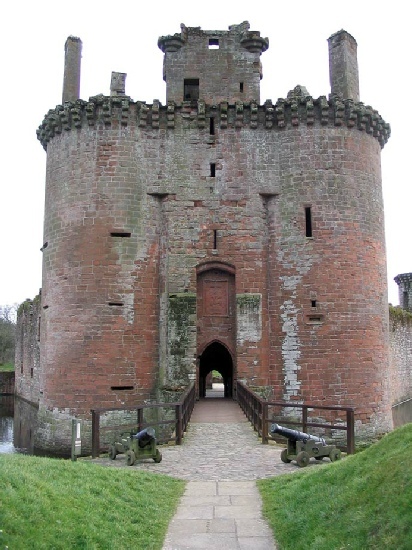 Caerlaverock Castle, along with their other titles, was restored to the Maxwell Clan in 1617. The new owner, Lord Robert Maxwell, built extensive new accommodation within the castle. A favourite of Charles I he was raised to Earl of Nithsdale in 1620 and built the Nithsdale Lodging at the castle which was completed by 1634. But the family, which remained loyally Catholic, was embroiled in the Bishops War; Robert Maxwell was strongly in favour of Charles I's unpopular attempts to align the churches of both his Kingdoms including trying to introduce Episcopacy (a hierarchy of Bishops) into the Church of Scotland rather than sustain Presbyterianism (a representative assembly). The Scottish opposition signed the National Covenant and raised an army to counter Charles and his supporters. In 1640 the army besieged Caerlaverock and, after a length thirteen week siege, forced its surrender. The castle was slighted and never rebuilt. Lord Robert Maxwell fled the country and spent the rest of his life in exile on the Isle of Man dying there in 1646.